Cy Dune is the pen name and mytho-rebel persona of Seth Olinsky, guitar virtuoso, vocalist, and songwriter of influential underground noise folk punk freaks Akron/Family. Cy Dune is known live as a celebration of the raw, elemental, transformative power of guitar and drums, where proto punk blast beat and origin blues rock n roll free jazz guitar extend over iconic, layered drum riffs creating a raucous and transcendent sound, drawing not only on Seth’s work with Akron/Family but also on his work with Swans founder Michael Gira and post minimalist mastermind Rhys Chatham, as well as collaborations with avant garde and free jazz musicians from Hamid Drake and William Parker to Keiji Haino and Tatsuya Nakatani. Like Seth’s dynamic work in Akron/Family, this explosive power can break down the wall between performer and audience to make way for a beautiful gem of a quiet desert love song, played to a breathless room that was just shouting and dancing and moshing around in sweat covered shirts a few minutes before. The Desert record is the original document of this Cy Dune experience. The initial music came about after experimentation making drum loops on a refurbished Alan Lomax Ampex 601-2, pushing the clash of layered 16th notes and African inspired triplet relationships to create a new, repetitive iconic drum sound. This process foreshadowed the meta sampling of the Cy Dune Summer Rebels project, but on Desert it is in it’s most raw and iconic form, layering energetic performances from free jazz drummer Andrew Barker and improv bassists William Parker (Cecil Taylor and Peter Brotzman) and Shazad Ismaily (Marc Ribot, Sam Amidon). The layered drums are mixed with ecstatic, shredding guitar excursions that capture Seth’s most inspired guitar playing recorded to date – simultaneously immediate and incisive and yet pushing out further than ever before into Seth’s free jazz background, drawing on Coltrane’s frenetic harmonic super-impositions and Ulmer-esque blues squall on the solos from When You Pass Me, Desert and Just Kids, and Sonny Sharrock-esque melodicism meets Ascendence-like group horn improvisation on the end of It is the Is which features Charles Waters (Gold Sparkle Band, William Parker Big Band) and Matt Bauder (Braxton, Bill Dixon, Arcade Fire) on horns, and then inter-mixed with beautiful post-Dylan desert odes and lost generation x pre-existential meanderings. This set of songs was penned in the Sonoran Desert, after Seth and Lightning co-founder Ali Beletic moved to the desert in 2010, tested at various adobe house shows around Tucson, dim light, mattresses on the walls, at first with drums just loaded up on a Roland sp-202 (the old black and orange one) running through a bass amp, then sometimes out in open desert arroyos running off of battery power at the sound/noise poetry happenings that John from A&T organized with other poetry professors from the U of A and their friends from Montana or Oregon traveling through town and reading out of little books, and then eventually at SXSW with 40 drummers, including Dana Janssen from Akron/Family, Joey Westerlund from Megafaun, Ian Chang from Son Lux and Max Jaffe from Jobs. Seth moved to Joshua Tree in 2014 and this batch of desert songs continued to be deconstructed and developed, becoming part of installations cut together with Ampex samples of old blues tunes, merging into post-minimalist compositions performed in the Integratron, and then installed out in the desert with multiple amplifiers running off generators. Lightning Records is excited to make the recordings of these songs available for the first time. Desert is the first in a series of Cy Dune archival releases from Lightning Records in 2019 (along with Against Face, and Summer Rebels), leading towards the release of a new Cy Dune full length in 2020. 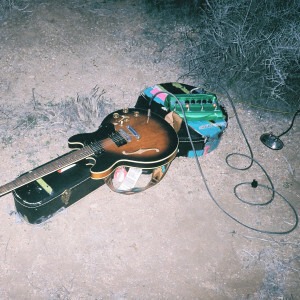 Desert was recorded in Tucson, AZ and Joshua Tree, CA along with sessions in Brooklyn with drummer Andrew Barker, and bassists Shazad Ismaily and William Parker, with additional contributions in Philadelphia by David Hartley (Nightlands, War on Drugs), and Chris Powell (Need New Body, Icy Demons). Desert was mixed in Detroit by Chris Koltay (Akron/Family, Liars, Deerhunter, Dirtbombs) and mastered in Brooklyn by Heba Kadry (Bjork, Lightning Bolt, Zs, John Maus). Cover photo by Patrick Gookin, taken at Lightning 001 which was held at the High Desert Test Sites location in Pioneertown, CA. IMAGES: To download, click above.